In addition to this, we have our own design unit that uses CAD/CAM and other designing software to bring out innovation in terms of functionality and design of the machines. 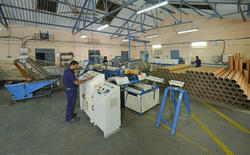 We are instrumental from last four decades and have served a large number of clients with innovative machinery. The broad range of products was developed efficiently because we own a constantly upgraded infrastructure that is designed with most modern concepts. It optimizes productivity at our highly equipped manufacturing units and makes us able to leverage leading technological advancements at our processing, packaging and quality control department.